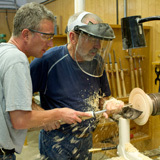 Since 1983, Craft Supplies USA has earned a reputation as the premier woodturning school in the world. Every year, we have the very finest woodturning teach 2,3 and 5 day woodturning courses at our woodturning workshop facility in Provo, Utah. Instructors include Richard Raffan, Mike Mahoney, Kirk DeHeer, Rex Burningham, Dale Dallon and more. If you want to improve your woodturning skills or just want to get started woodturning right so you don’t have to break bad habits, you’ll learn more in a few days with us than in years on your own. 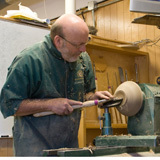 Choose from Basic Woodturning, Intermediate Woodturning and Signature Workshops by top professionals and get started woodturning today.